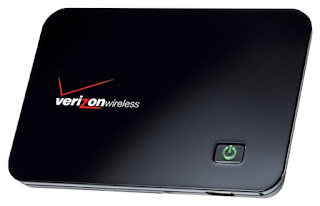 Verizon Wireless is ready to launch a Wi-Fi enabled hot spot device called the MiFi 2200 Intelligent Mobile Hotspot. The carrier, which used to advertise the benefits of its mobile data network over Wi-Fi, plans to start selling a Wi-Fi-enabled device that lets customers share Internet connectivity. The device lets customers share Internet connectivity as long as one person is hooked up to the Verizon 3G network. The device acts as a personal Wi-Fi cloud, accommodating up to five Wi-Fi-enabled devices, including notebooks, netbooks, cameras, gaming devices or portable media/MP3 players. The device is small enough to fit in a pocket, and it weighs just over 2 ounces, according to a Verizon spokeswoman. It includes integrated internal CDMA and Wi-Fi antennas, security and authentication. When one device is connected through Wi-Fi, the MiFi 2200’s rechargeable battery provides up to four hours of active use and 40 hours of standby time on a single charge. The MiFi 2200 will go on sale on May 17 for $99.99 after a $50 rebate and new two-year agreement. Price plans range from $40 a month to $60 a month. Customers also can get a day pass for $15 when the device is purchased at full retail price without a monthly service plan. Verizon Communications Inc. is also planning to offer free Wi-Fi access at hotspots to subscribers to its home broadband services, according to informed sources. The company is in talks with Boingo, a startup that counts former EarthLink founder Sky Dayton as chairman, to deliver the access. Discussions are in the early stages, and Verizon is uncertain about particulars like whether users would have free access only in their regions or nationwide. The service may launch as soon as the summer, according to reports. The move comes as more users are turning to mobile devices like cell phones and laptops to connect to the Internet. Some Verizon rivals, meanwhile, already provide subscribers to their home broadband services free access at wifi hot spots. AT&T Inc., the country’s second largest cell phone company, offers broadband subscribers free wifi access at hotspots. Cable operator Cablevision Systems Corp. rolled out a wifi network available for free to broadband subscribers in its Long Island, NY footprint last year. Boingo’s network of Wi-Fi hotspots – which includes more than 100,000 locations around the world – will be available to both Verizon FiOS and DSL broadband subscribers. Boingo charges users $9.95 a month for access at North American hotspots, such as airports, cafes and restaurants. Verizon would likely offer Boingo service to its DSL and FiOS subscribers. Verizon and Boingo would not comment on the potential partnership.